Design Review Based on Failure Mode (DRBFM) was created by Tatsuhiko Yoshimura, (Toyota). It is based off the approach that accidents are, considered to be, avoidable if found during the development of a design. Improper designs contribute to reduction in brand image, poor reliability and negative financial impacts. Many companies battle with the improvement process to mitigate design risk and often brainstorm updates to processes rather than determine actions to change the designs. 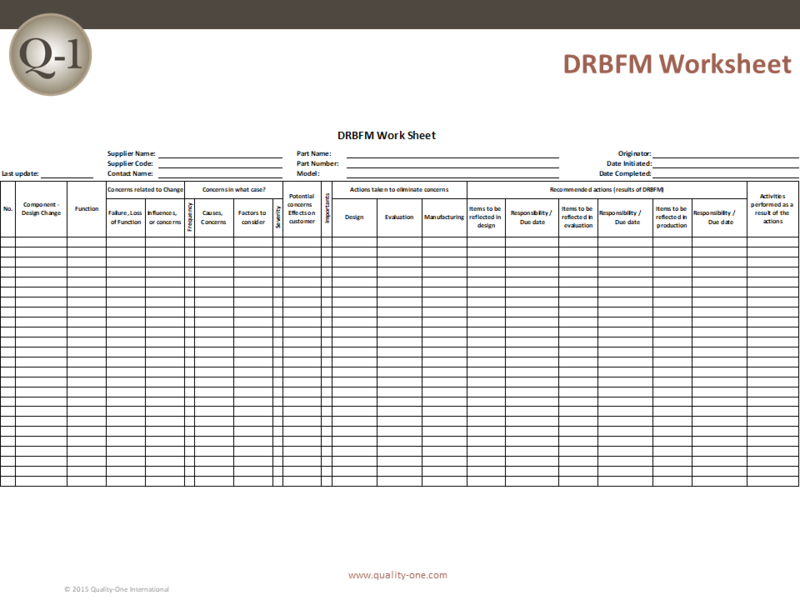 DRBFM is a visual process that may link to Failure Mode and Effects Analysis (FMEA) and Fault Tree Analysis (FTA), based on experience. Each member compares “good design” to the intentional changes and predicts possible failures. With the use of GD3 and brainstorming techniques, it evaluates design and manufacturing with respect to the technical causes. The method creates a robust format for problem solving. In addition to reducing design related issues, companies benefit from improved brand imaging, lower product cost and improved product development timing. Soft benefits include higher employee morale and increased job satisfaction. The systematic approached is used to create a comprehensive procedure that is proactive, ensuring a global view of the product hierarchy. This provides a map to ensure all levels of communication are addressed. These interactions contribute to including not only the designer, but the full system communication. 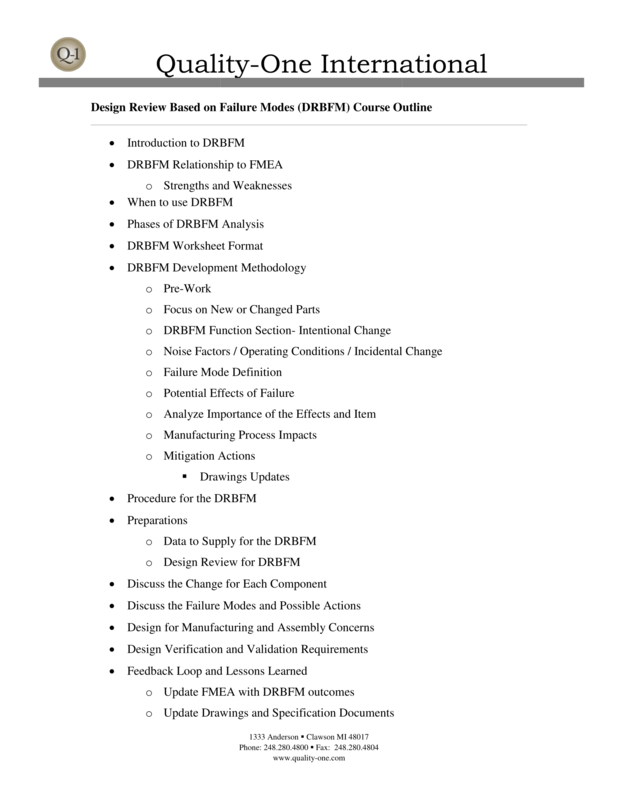 The following steps outline the process that applies mainly to intentional changes to designs, however can be applied to new designs while incorporating tools such as FMEA and FTA. When starting with an FMEA, focus on the components that are associated with the ‘deliberate change’. The DRBFM should be started on prototype drawings to increase the effectiveness of the process. Since most companies spend their time identifying issues without properly resolving them or ignoring the solution altogether, the team needs to stay within the defined scope. Facilitation can help manage the team’s focus and ensure the team understands what may adversely affect an already proven feature or features within the “Good Design”. Interactions between components will correlate to interactions between sub systems and system. Therefore, anything that is not understood at the feature or component change will be seen at higher level functions. Assemble all drawings, component examples, similar designs, etc. Consider stresses, forces, corrosion, oils, surfactants, temperature, handling, fasteners, correlation to the manufacturing process (Process FMEA), etc. Review one component / concern at a time. FTA may be a useful tool for this part of the process. The DRBFM Services available from Quality-One are DRBFM Consulting, DRBFM Training and DRBFM Support, which may include Facilitation, Auditing or Contract Services. Our experienced team of highly trained professionals will provide a customized approach for developing your people and processes based on your unique DRBFM needs. Whether you need Consulting to assist with a plan to deploy DRBFM, Training to help understand and drive improvement or hands-on Project Support for building and implementing your DRBFM process, Quality-One can support you! By utilizing our experienced Subject Matter Experts (SME) to work with your teams, Quality-One can help you appreciate the value of DRBFM in your organization. Quality-One offers Quality and Reliability Support for Product and Process Development through Consulting, Training and Project Support. Quality-One provides Knowledge, Guidance and Direction in Quality and Reliability activities, tailored to your unique wants, needs and desires. Let us help you Discover the Value of DRBFM Consulting, DRBFM Training or DRBFM Project Support.